Sell our stuff or put it in storage. Explore the world (our classroom). That last one starts on Wednesday. We better get packing! So, where are we going and what will we do? We have some ideas, but few firm plans. Mostly we’ll figure it out as we go. Of course we have to start somewhere, so we’ve given ourselves quite a challenge for the beginning of the trip: fly to Amsterdam, buy used bicycles, strap our stuff to the bikes and ride across Europe on the Eurovelo 15 cycle route which follows the Rhine river from its source in the Alps of Switzerland, through Germany, France and the Netherlands to its mouth in the North Sea. Map of the Eurovelo 15 route. 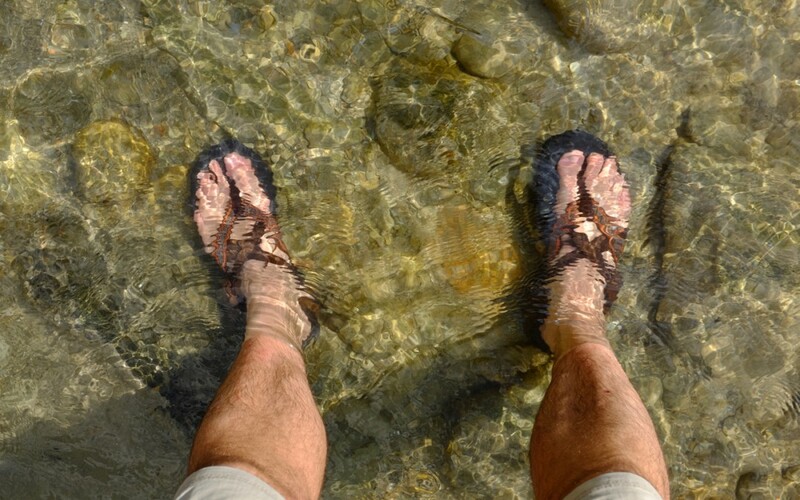 The Rhine is the second longest river in Europe, and our route is about 1,400 km. Pop quiz: If one kilometer equals 0.621371 miles, how far is the route in miles? Will we actually make it all the way? How long will it take us? What will we learn along the way? Iceland, airplane trouble, a surprise trip to Scotland, and finally Amsterdam! Here we sit, nibbling fruit and cheese on the shores of the IJmeer. Yes, we are finally in Amsterdam! Our legs are tired from a day pedaling back and forth across the city on various errands in preparation for our EuroVelo bike trip. It feels good to be back in Amsterdam. 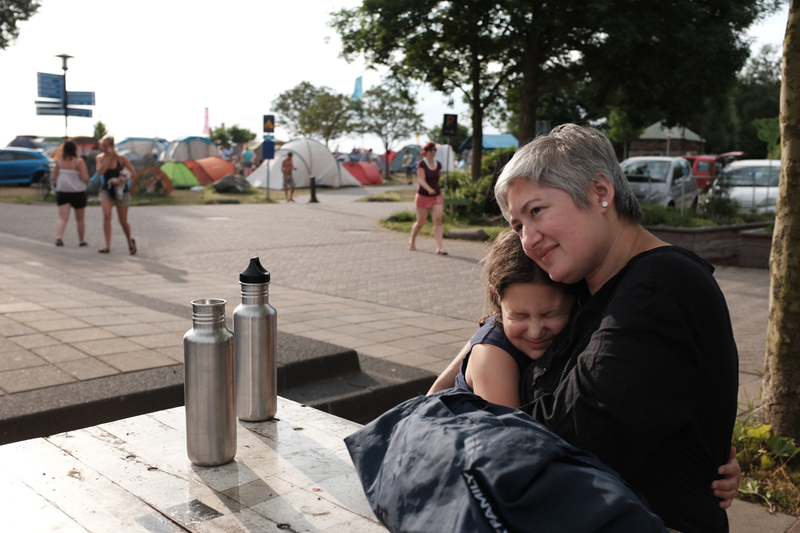 It’s easy to fall back into the relaxed groove of summer in Amsterdam, although this time we’ve traded the houseboat for a swanky pod hotel and now a tent (more on that later). The flight to Boston and and layover was uneventful. 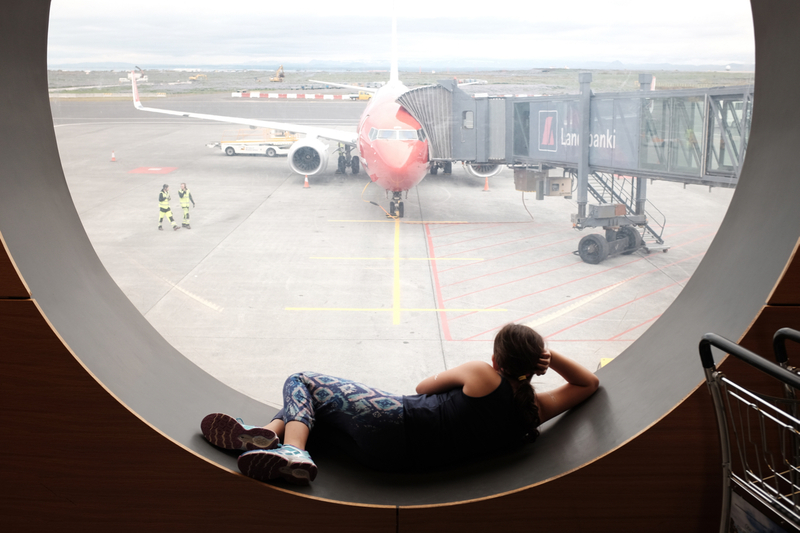 The Icelandair flight to Reykjavik was most noteworthy for the interior design of the Icelandair planes and what we learned about Iceland. The cabin lights along the fuselage were a very cool white color temperature, reminiscent of sea ice, and the ceiling lights along the overhead bins were color changing LEDs that looked like the slowly morphing Northern Lights (the photo doesn’t do it justice). Very thoughtful design and great branding. The flight was a surprise opportunity for us to learn about geothermal energy. Iceland sits along the fault where the North American and European tectonic plates meet, and is a “hot bed” of seismic and volcanic activity. There is A LOT of heat and energy stored underground in Iceland. 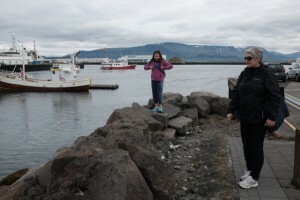 There are active volcanoes, geysers, and hot springs around the islands, and this energy from the earth is harnessed by the Icelandic people for a variety of purposes. Around Reykjavik they extract the naturally occurring hot water and steam from underground to heat their homes, offices, water, and even keep the streets and sidewalks snow-free (there is a network of geothermal hot water pipes under the surface of the streets and sidewalks that heats their surface!). 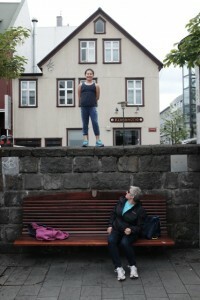 What percentage of Iceland's energy usage is from renewable sources? Answer: 85% – one of the highest rates in the world! About 90% of homes and buildings in Iceland are heated geothermally. The 8 or so hours we spent in Iceland were a pleasure. 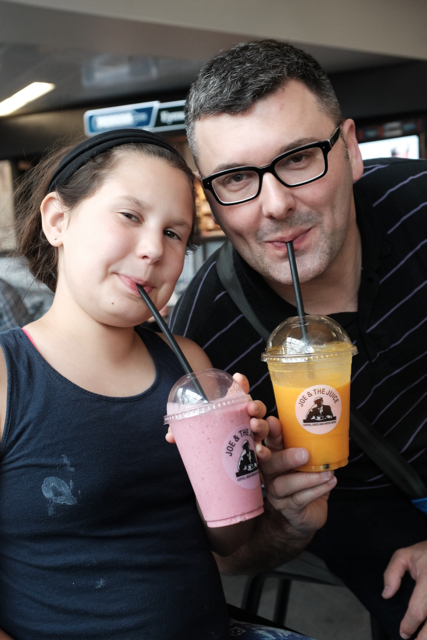 The “food” in the Boston airport was, well, disgusting so we were pleased to find a super-yummy place in the Keflavík International Airport. “Joe and The Juice” serves fresh juice and delicious sandwiches on toasted brown bread. 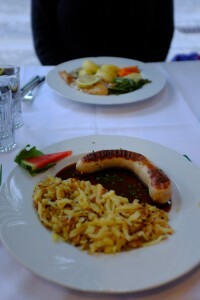 It sounds hippy-dippy, but it was delicious! 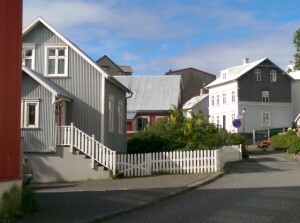 We took a bus from the airport to Reykjavik (about 40 mins) and spent a few hours walking around the quaint and quiet city. After the quick Reykjavik walkabout, it was back to the airport for the flight to Amsterdam. Our 4:30 departure was delayed slightly by an equipment issue, but we were soon back in the air. We were exhausted. 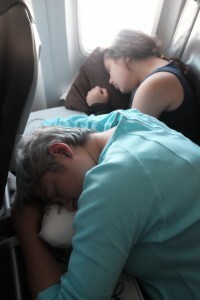 Mila and Jette managed to get a little sleep on the plane. 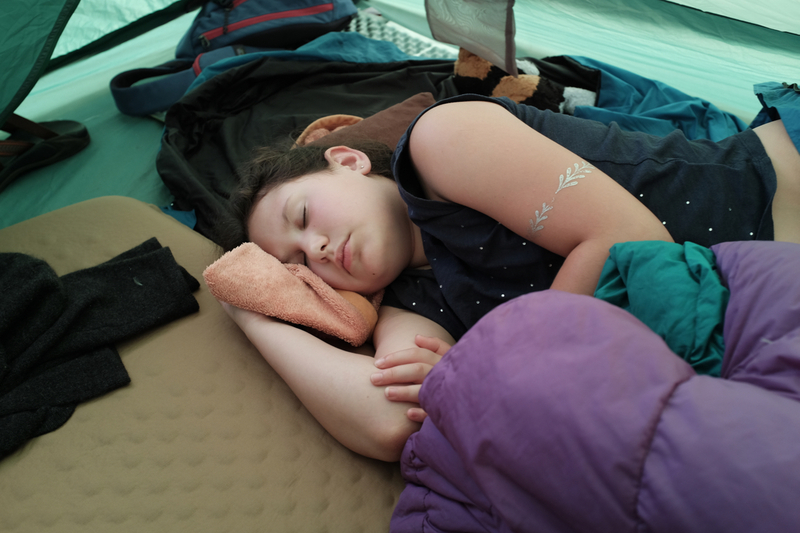 I nodded off just long enough to give me a crick in the neck! At some point in the flight, the captain announced that we were having “equipment issues” and would be landing in Glasgow, Scotland. I almost never get nervous on commercial airplanes, but I have to admit that I was a little bit jittery. It is not everyday that the captain of an airplane on a trans-Atlantic flight announces “equipment issues” and a bee line for the first chunk of dry ground! We landed safely in Glasgow and sat on the runway. After some time we were directed off the plane and into the airport terminal which was, by that time, already closed. After a while they brought us bottled water and said they were flying a part in. 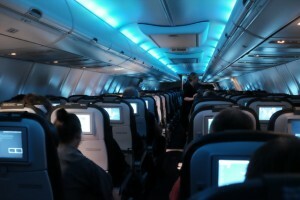 As midnight approached they announced that the airline would be finding hotel rooms for all of the passengers. We were shuffled downstairs, through immigration and into a long line of 200 or 300 people. Names were taken, arrangements were made, and we were soon in a cab to one of the airport hotels where we waited in another long line to check-in. 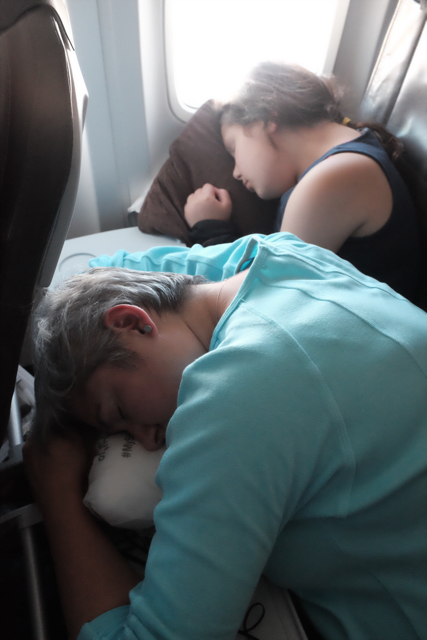 It was after 1 am on Thursday when we finally put our heads on a pillow. The last bed we had seen was on Tuesday night. Though still tired, we were up early Friday morning for a quick breakfast and a shuttle ride back to the airport. 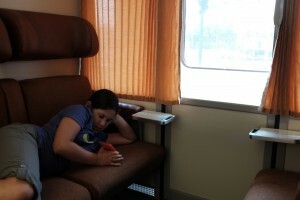 Word among the passengers was that we would be departing at noon but that wasn’t to be. We ended up spending a full day at the Glasgow Airport. It was our first trip to Scotland, and we didn’t see much, but we made the best of it! It was beautiful, sunny day. 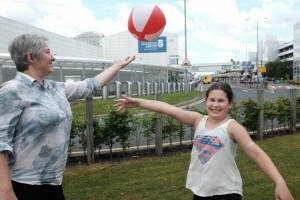 We lounged on the airport lawn with some of our fellow travelers and played volleyball with a free, promotional beachball from one of the vendors in the airport. It wasn’t cloudy or raining. Could we have really been in Glasgow?! We finally arrived in Amsterdam at 10 pm on Thursday about 60 hours after our Dallas departure. We checked in to the very fun and swanky CitizenM Hotel on the ground of Schiphol Airport, so it wasn’t long before we were snoozing in a real bed! 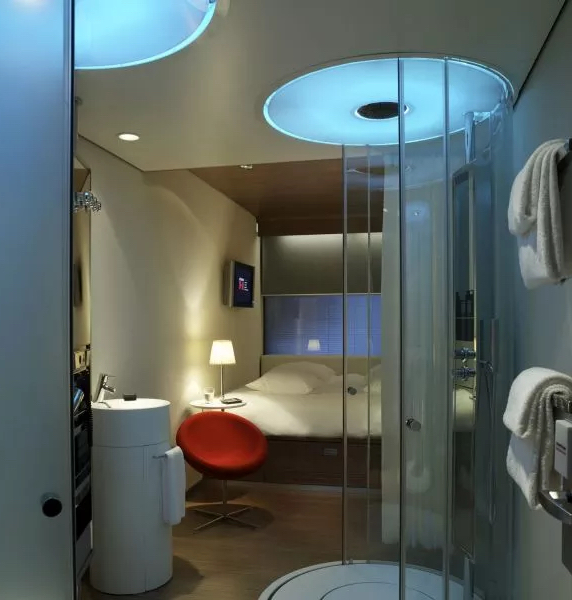 The CitizenM is a “pod” hotel. The showers are glass “tubes” in the room with color changing LED lights controlled with an iPad. Fun stuff. Fun room with shower and toilet “tubes” and one super-gigantic bed. 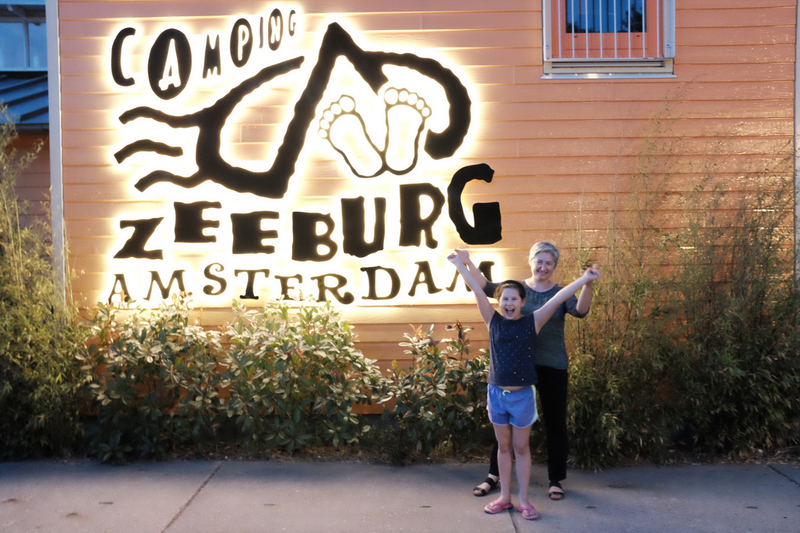 After one night in the fun and funky CitizenM, we switched to a tent in the equally fun and funky Camping Zeeburg Amsterdam campground. Say hello to Franken-Frog, Green Goblin, and The Parminator. These are our new beasts of burden. 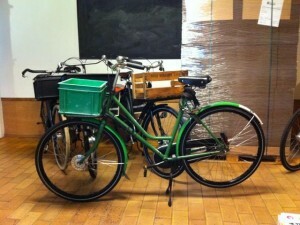 The Parminator and Green Goblin are used Dutch city bikes from WorkCycles. Franken-Frog is a new Frog Hybrid, modified for our purposes. While quite a nice ride, the basic bike starts at $3,700. That would be $11,100 for three, not including thousands more for shipping, racks, bags, and all the extras stuff one needs for an extended bike trip. 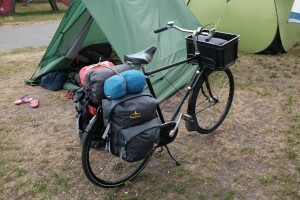 Of course, my daily commuter bike, the Surly Long Haul Trucker, is a great touring bicycle too, and at $1,300 for the basic bike, is considerably more cost-effective. 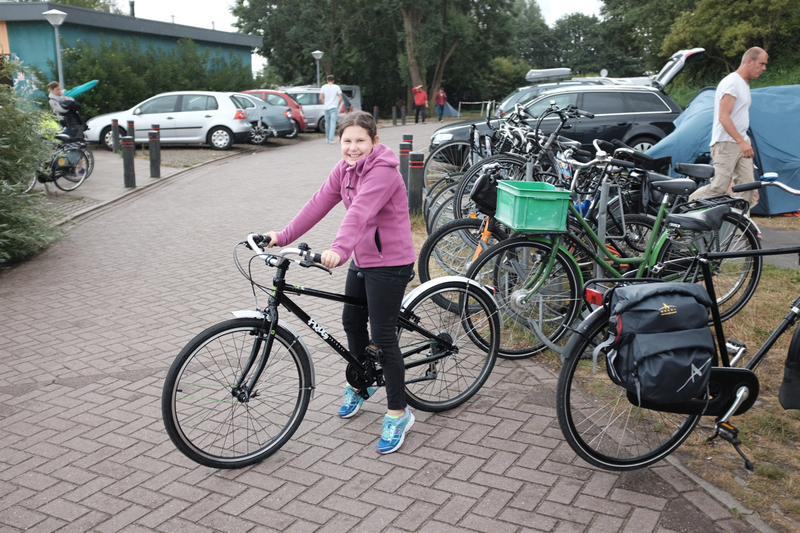 Bike geeks will probably find our actual choice of bicycles for this trip insane.We’ve bought simple, well-used Dutch city bikes for this trip. This should add a bit of a challenge factor to the tour. 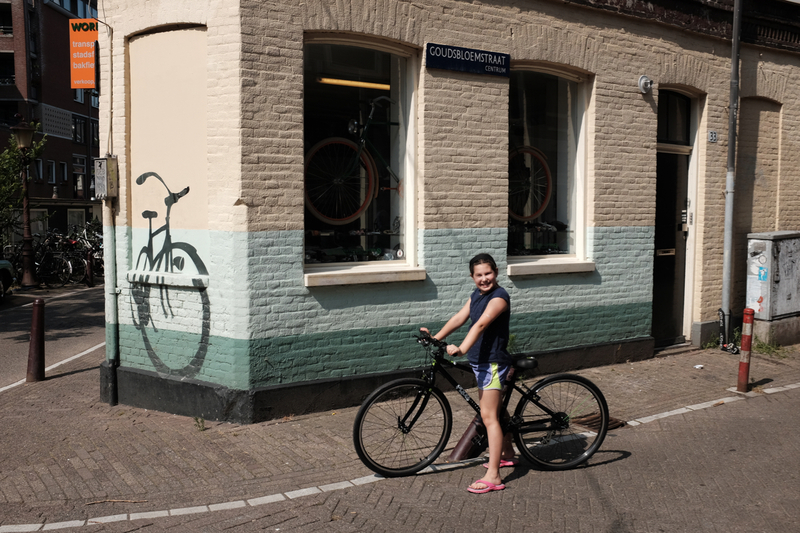 If Annie Londenderry could circle the globe on an 1890’s bicycle, surely we can get across Europe a couple of “old beaters,” right?! 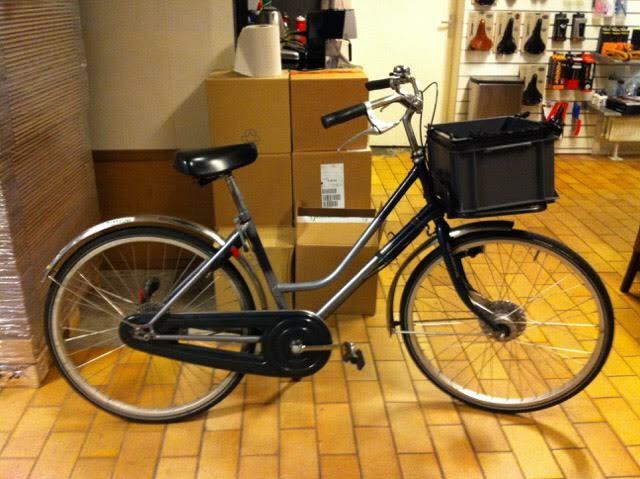 Shimano Nexus 3-Speed hub with coaster brake. 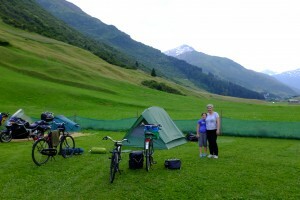 (Yes, a three-speed and coaster brake in the Alps!!!) Gearing: High. Not easy to count teeth with the full chain case, and I haven’t bothered to remove it. Let’s just say it is geared for flat ground. 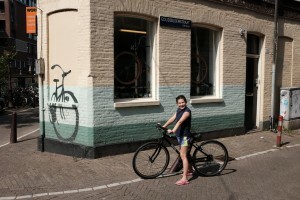 We’ve been riding around very flat Amsterdam for a few days and I have yet to shift out of first gear. Wheels – sturdy rims (unknown make), 36H, chunky spokes. I won’t “taco” these wheels! 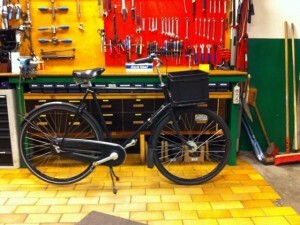 Schwalbe Marathon tire on the rear, something old on the front. I’m debating swapping this for a new Schwalbe Marathon. Shimano Nexus three-speed hub with coaster brake. Front Nexus roller brake. Wheels – see above. Schwalbe Marathon tires. 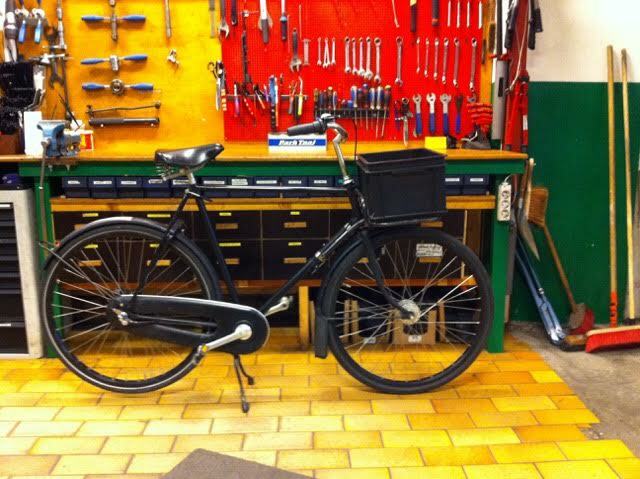 Not quite city bike, not quite standard hybrid. I think they might have been a little embarrassed by its unconventional nature, but Jette loves it. 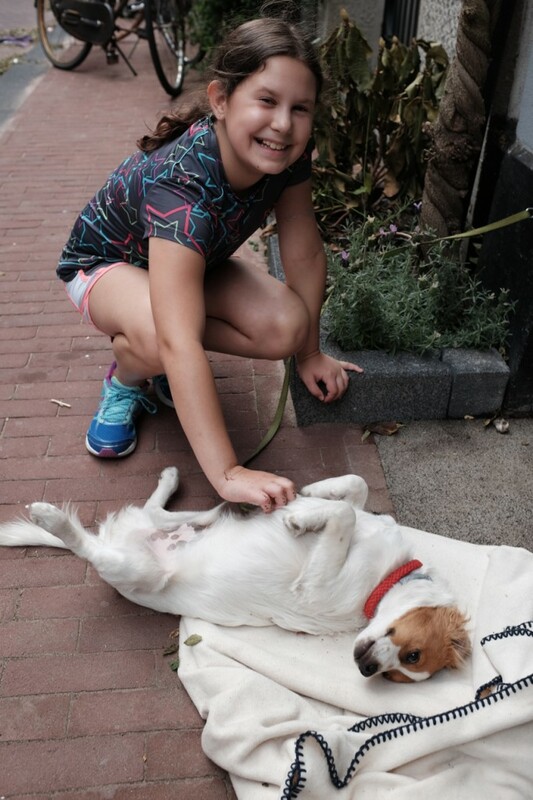 It is much more comfortable for her and seems to be a perfect fit. It is lightweight, well made, and sports 8 speeds and good rim brakes. We picked it up day-before-yesterday that night we had a hard time getting her to stop riding and go to bed! 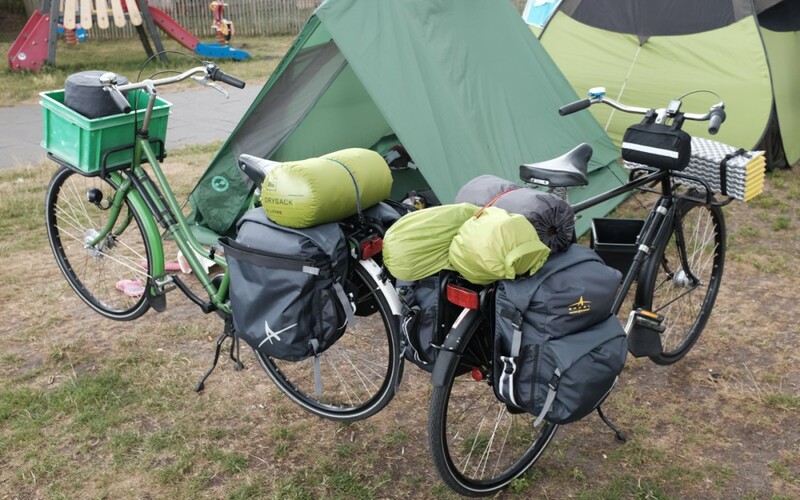 We will be taking the train to Switzerland tomorrow, so today I’m trying to figure out how to get our stuff packed in the Arkel panniers and other bags we brought with us, and then how to get it all on the bikes. We have a ton of stuff! Test packing the Parminator – front crate still on and sleeping bags not in dry sacs. 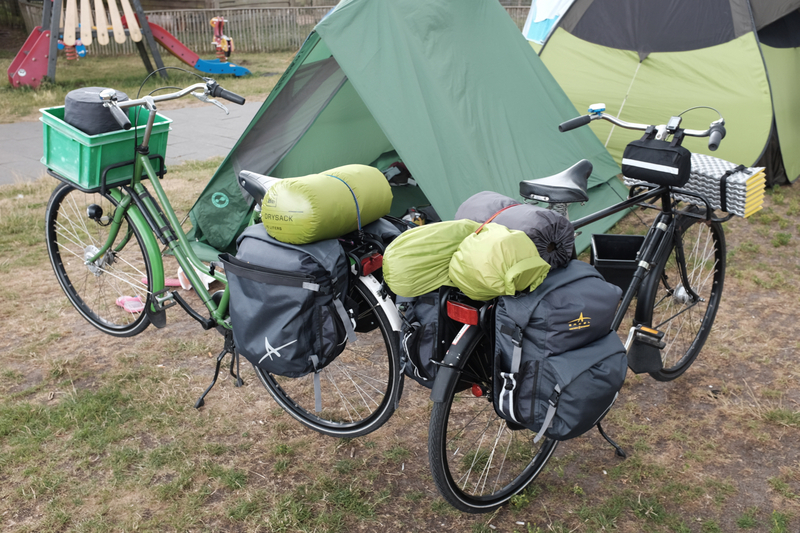 Both bikes, about two-thirds packed. In the last photo above, I’ve removed the plastic crate on the front rack of The Parminator so that I will have a place to strap the tent, foam sleeping pad, and who knows what else! OK, that’s it for now. Have to go figure out how to pack up the rest of our junk for our morning departure! 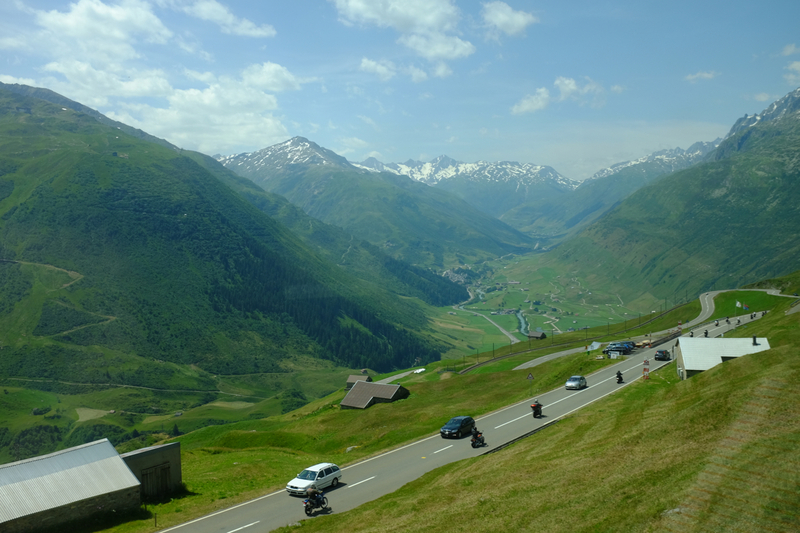 It has been a whirlwind few days getting from the flatlands of the Netherlands to the mountains of Switzerland. 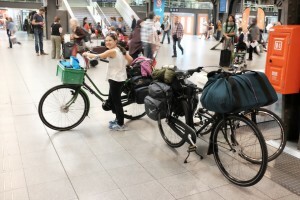 On Friday morning, we loaded the bikes for the first time and rode to the Amsterdam Centraal Train Station. The day before we had purchased tickets to Andermatt, Switzerland for ourselves and our bikes. 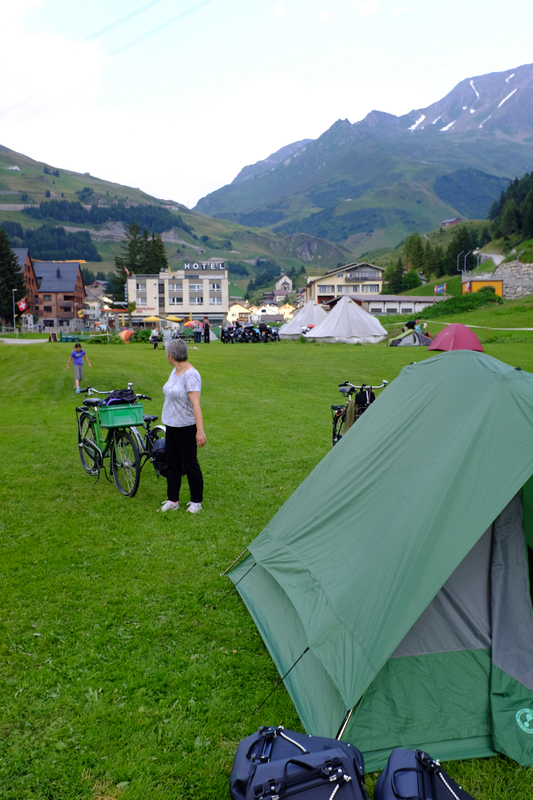 Originally we had hoped to take a night train with sleeping bunks to Switzerland, but because we were traveling with bikes and it is the Summer high season, there were no such tickets available for weeks. 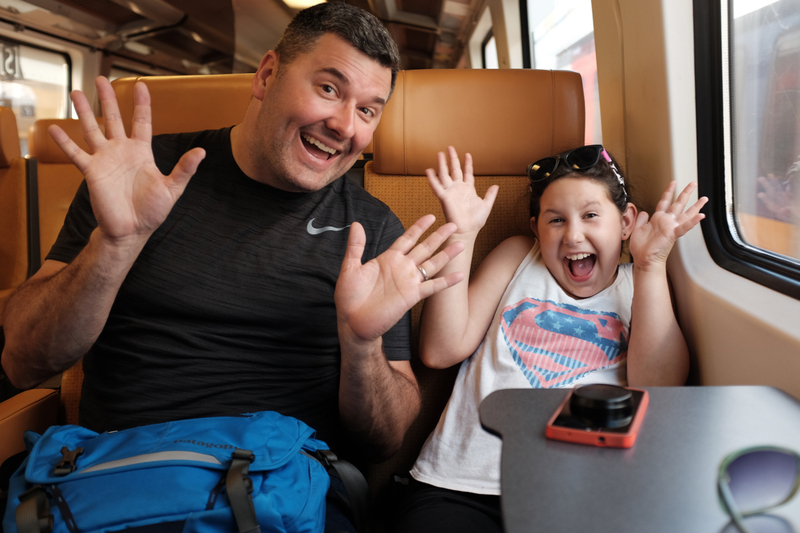 We ended up with tickets to Andermatt that required an overnight stay in Brussels, Belgium and a total of 5 train changes as we passed through the Netherlands, France, Luxemburg, and Switzerland. We immediately discovered that train travel was bit more challenging with heavily loaded bicycles! 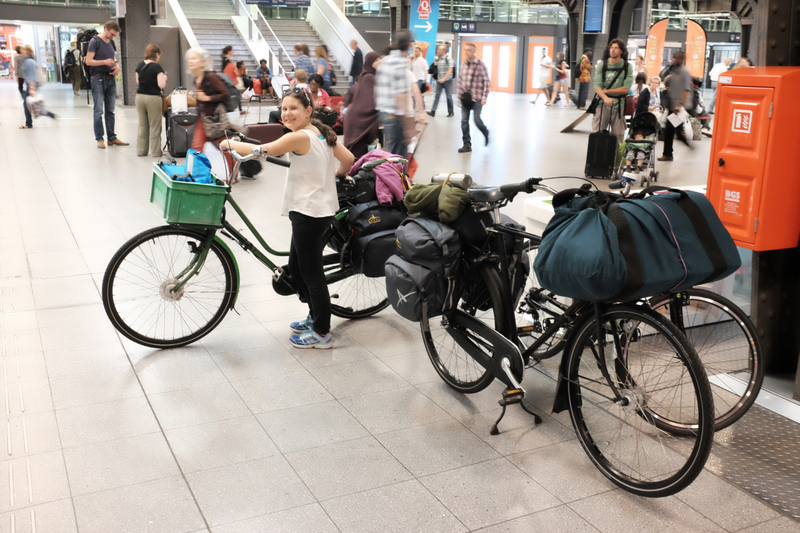 We rolled our heavily loaded bike into the Amsterdam station and discovered that the escalator to the platform was not working. We were faced with hundreds of pounds of bikes and baggage and a long stairway up to the platform. 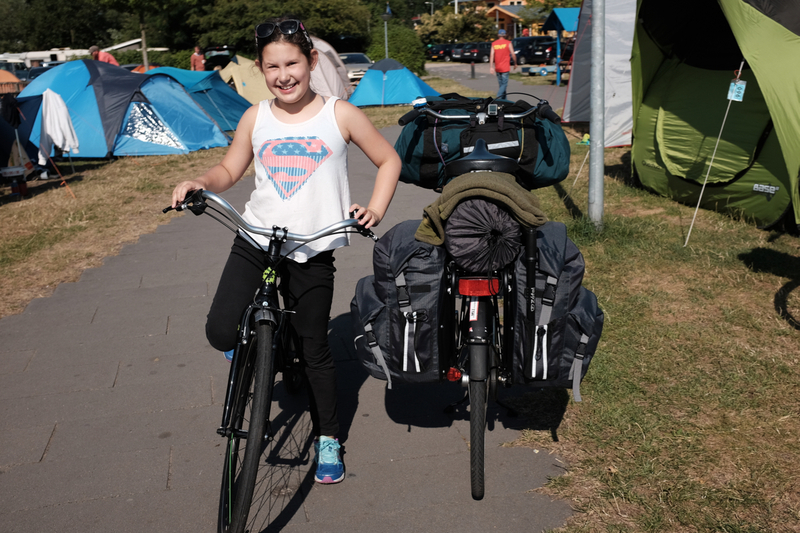 When loaded, our bikes are too heavy to lift. 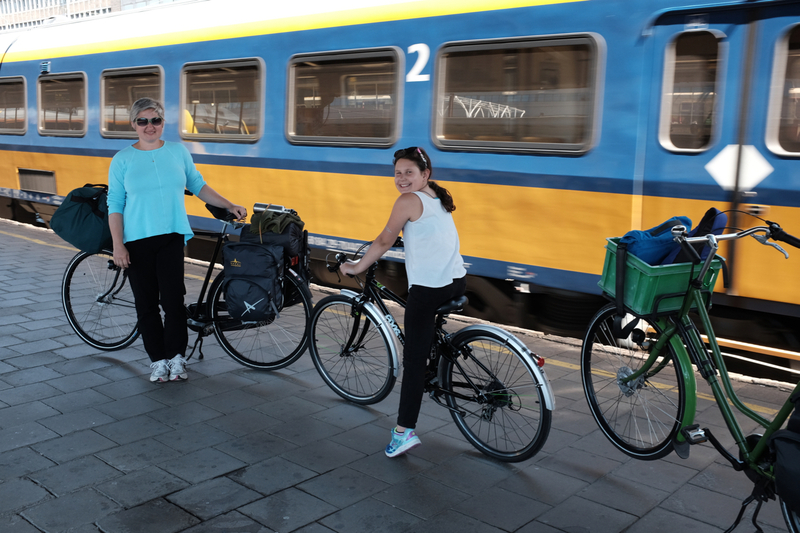 So, getting on the first train in Amsterdam required us to pull the bags off the bikes, and make multiple trips up and down, up and down the long stairs to the platform lugging bags and bikes. 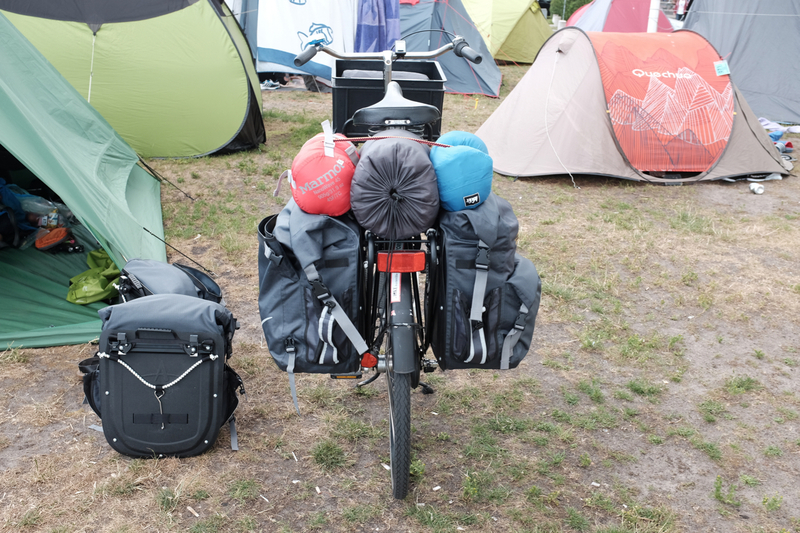 Once we had everything up on the platform, we loaded all the bags on the bikes again to get everything down the platform. 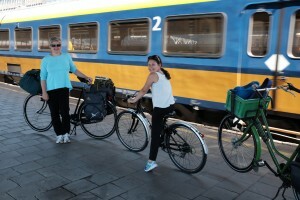 When the train arrived, there was a mad scramble to find a car that would accomodate the bicycles, and then a rush to get to that car, pull the bags off the bikes, hoist the bikes into the train, and load ourselves and our luggage before the train left the station. This we repeated at each of the five stations where we changed trains, and one where we did not. 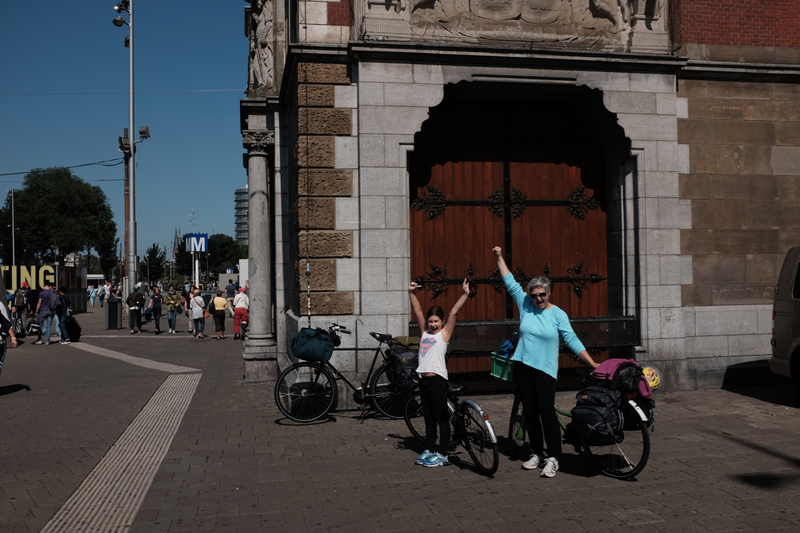 Our itinerary had us spending the night in Brussels, so when we arrived we did the strenuous “bicycle train station dance,” loaded our bikes and set out for the hotel Mila had found online. We didn’t have map of brussels (or connections for our phones) so we asked for directions at the hotel across the street from the train station and set off in the horrible early evening traffic of Brussels. We were on a busy main street, so we walked our bikes for quite a while, then, when a bike lane appeared and the traffic calmed a bit, we hopped on our bikes. 15 minutes later we pulled up to Hotel Belleview, found a nice spot to lock up the bikes, checked in, and enjoyed a well-earned shower. 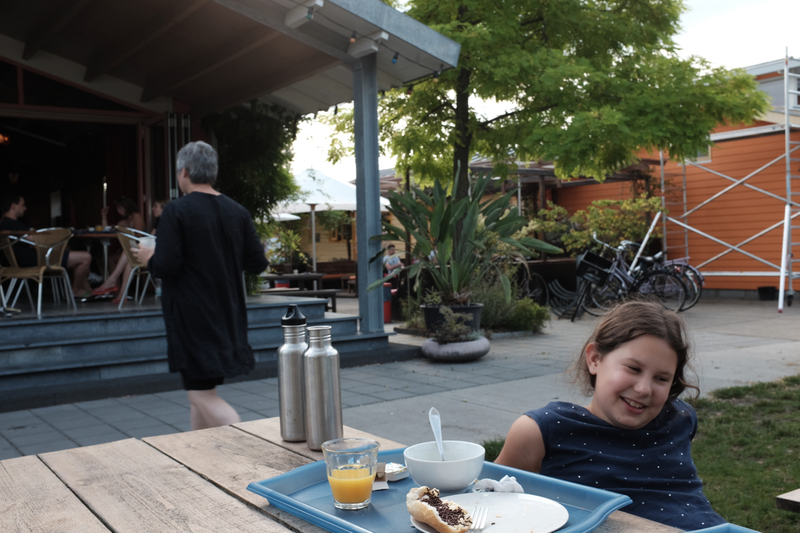 After we cleaned up, we ventured out on foot to dinner at Bij Den Boer, a local seafood restaurant where we sat on the sidewalk patio and enjoyed a nice dinner. 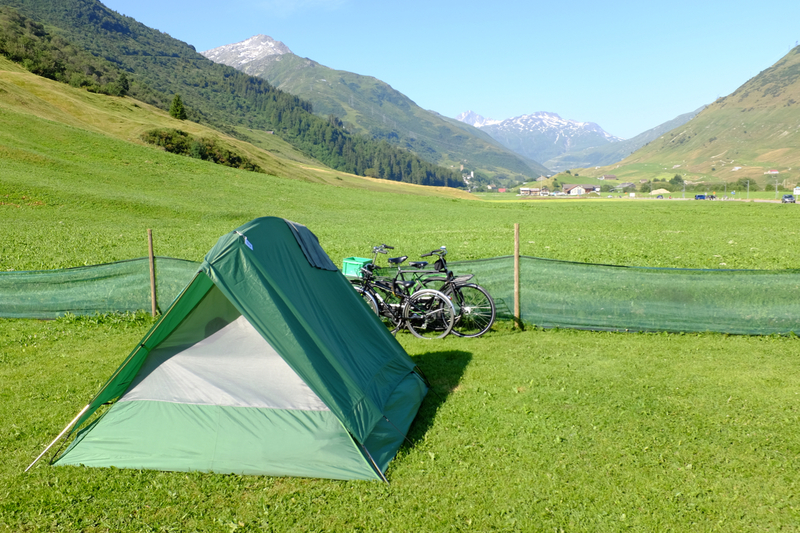 The next morning we were up at 5 a.m. packing our bikes for a ride to the train station and the train, or rather, the next 4 trains to Andermatt, Switzerland, very near the source of the Rhine River. 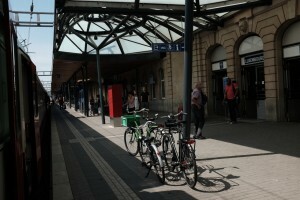 When we left France and stopped at a station in Luxembourg, the staff on the train changed. 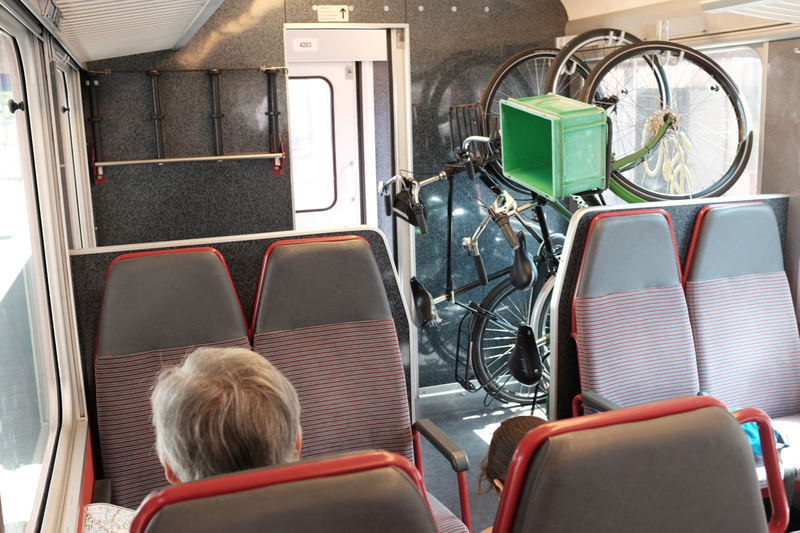 The new conductors came through, checked tickets and told us in rapid-fire French that our bikes would have to be moved to another car. The stop at the station was only minutes, and much confusion ensued as we made the 6 or 8 trips required to pull all of our stuff – bikes and bags – off the train an onto the platform. Meanwhile, a team of three conductors barked at us in French, often with contradictory instructions and directions. Mila and Jette were hustled down the platform with some of the bags and disappeared. 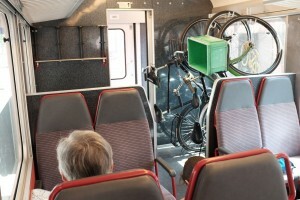 I was hoisting the bikes into a different car with the “help” of one of the conductors. Just as the train was beginning to move, I grabbed our last bag – the huge green duffel bag, and was directed into a one of the cars. I hopped on and walked the length of the car looking for Mila and Jette. They were nowhere to be seen. I knew they must be on the train so I hoisted the heavy duffel over my shoulder so I could fit down the narrow isles, and started walking from car to car looking for them. 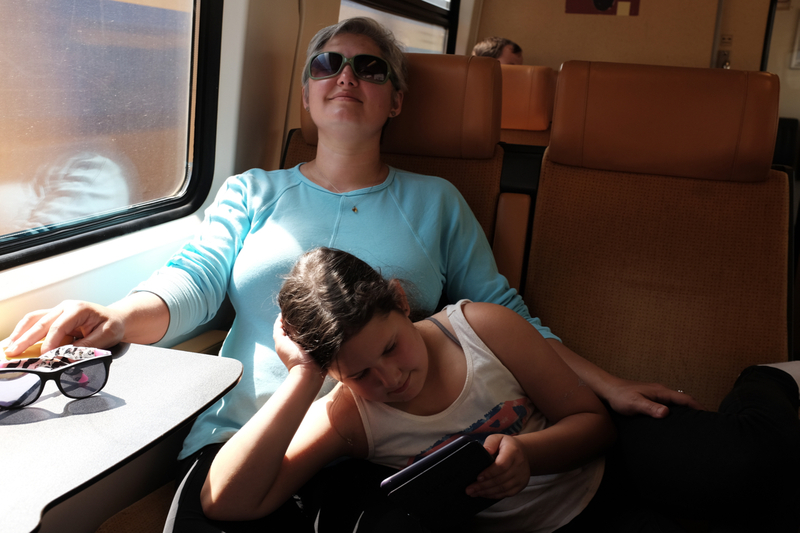 Ultimately I found them (and a very distressed Mila who thought the train had left me at the station) in a first-class compartment. We had been upgraded. Nice! Luxembourg, we take back all of those curses we hurled at you back at the station. 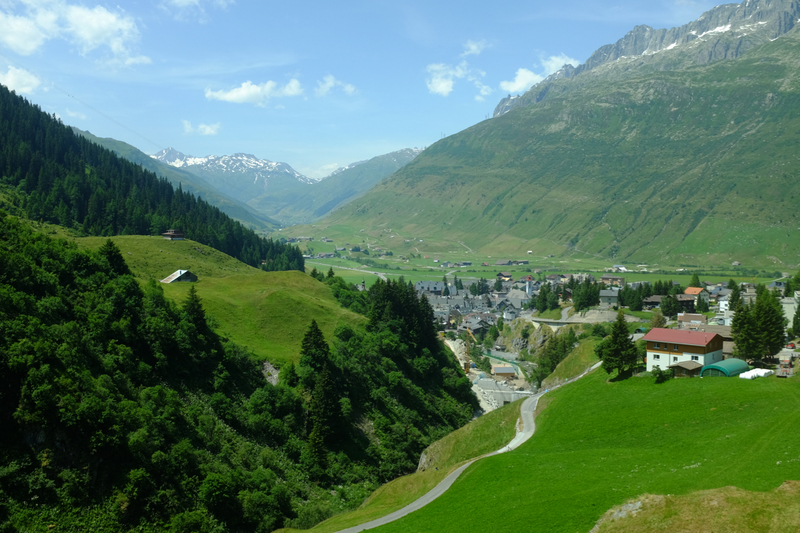 After what seemed like endless trains, stations, loadings and unloadings, we made it to Andermatt, Switzerland. 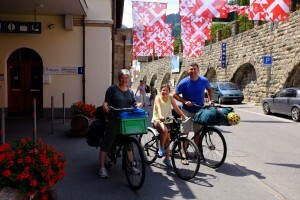 We loaded the bikes and rode through this beautiful village nestled in among the peaks of the Alps. We cruised through town, then looked for Basecamp Andermatt where we thought we might stay. 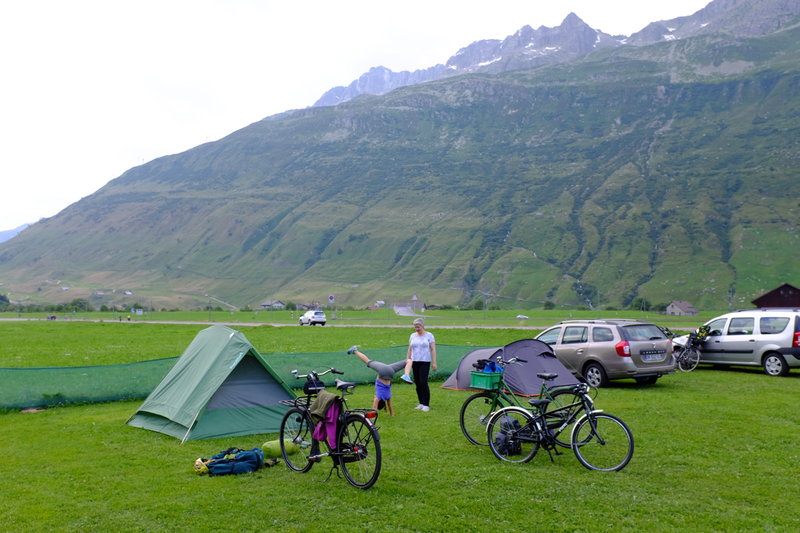 After half an hour of more of searching for it with no luck we rode across town to the Andermatt Campground which is a beautiful green field on the edge of town. Just a simple patch of grass, but wow, what views! We pitched our tent, stashed our gear, locked our bikes, and went for a stroll to find dinner. 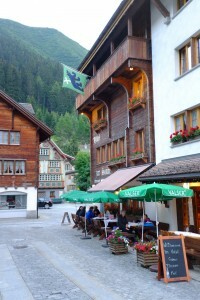 We ate on the sidewalk patio of the local joint that seemed busiest with folks who looked like locals. 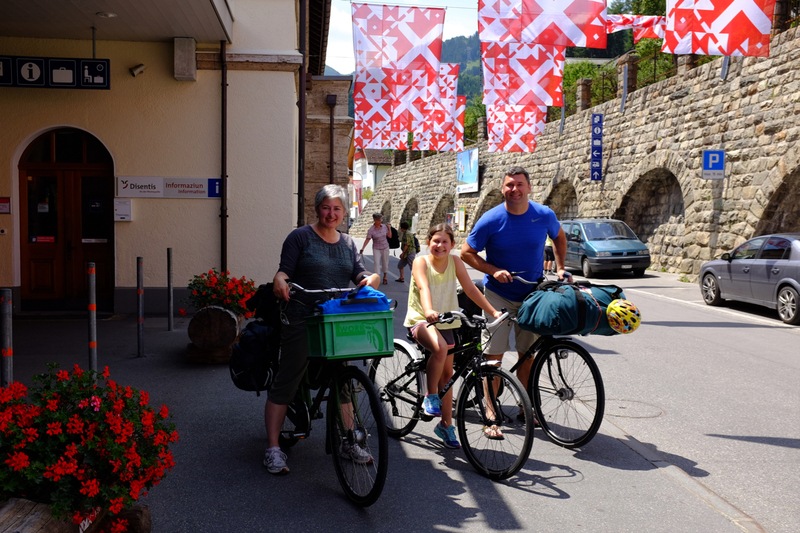 Although it was no surprise, it was immediately clear that our bikes and our bodies were not ready for alpine roads. Our simple, heavy three-speeds are gear for flat ground or small hills, not mountain passes. With just a “backpedal” or “coaster” brake, my bike lacks the stopping power for real hills, especially when loaded with 100 lbs. of bags and 220 lbs. of me. I could make it up the hills, but getting back down was a challenge with the lack of braking power. 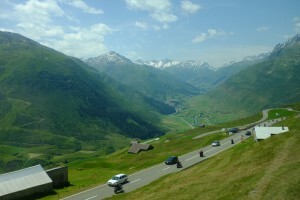 Not to mention the fact that none of us have the “legs” for the real mountain passes. While the narrow two lane mountain highways offer beautiful views, they are too much for us. 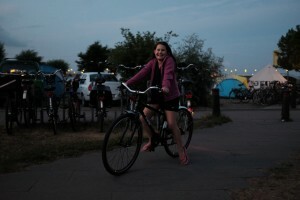 Plus, they are crowded with surprising number of motorcyclists, trucks, busses, cars, and other cyclists. 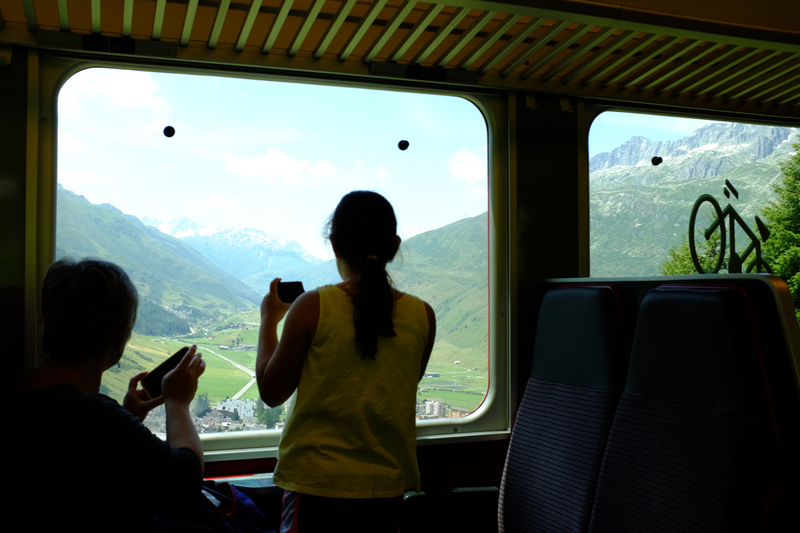 We’ll take the train to lower altitudes, thank you very much. 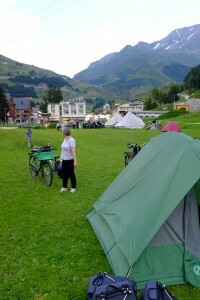 So in the morning, we packed up the bikes and rode to the train station for the train to Disentis.